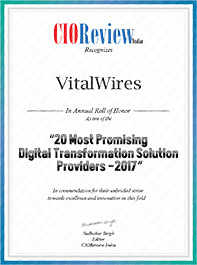 Vital Wires get recognised in 20 Most Promising Digital Transformation Companies in India. Based out of Gurugram, VitalWires Consulting offers a wide range of SAP/ERP consulting services and solutions to enterprise customers thereby assisting them to embrace the digital transformation. 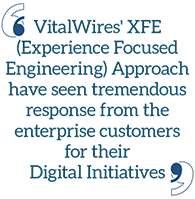 Since its establishment in 2010, the organization has been deploying latest and disruptive ROI oriented technologies while meeting organizational requisites. Being one of the early adopters in Digital landscape, VitalWires connects with customers as a strategic SAP Digital partner helping them bring out systems and solutions which are lean, and highly optimized. With the rapid adoption of IoT, Artificial Intelligence & Machine Learning, businesses must embrace a sales digital transformation. More so, they need to craft their sales technology with seller enablement and empowerment in mind. Adhering to the disruption brought by automation and mobility technology, VitalWires facilitates a new age Sales Force Automation platform called BeatRoute. Beatroute as a mobility platform helps feet-on-street in field execution activities and delivers higher sales to companies in FMCG and consumer durables industry across trade and retail channels. The platform has been successfully deployed by more than 100 customers worldwide. Observing the increasing demand for technologies that can track product and production information and share it across regions and throughout the value chain, VitalWires avails AgriMart as a procurement engine handles ecosystem between farm producers and manufacturers. "Our both initiatives have been focused on CPG Industry and have been received very well by our customers. In fact, Beatroute has already been spun-off as a separate business entity backed by investors", says Vivek. The organization emphasizes to transform the way enterprise users engage with these applications / systems including SAP. VitalWires' XFE (Experience Focused Engineering) Approach have seen tremendous response from the enterprise customers for their Digital Initiatives. In an effort to incubate design thinking in its DNA, the organization recently has acquired Two55am, a Design/ UX studio that delivers cutting edge technologies solutions around IoT, Artificial Intelligence and Machine Learning while ensuring effective UX practice. “We clearly foresee more than 50 percent of our revenues coming in from these added services over next 36 months”, adds Sumit who was at helm of Two55am prior acquisition by Vitalwires. Having developed new capabilities and practice, VitalWires has gradually emerged as one of the key providers of digital transformation services with SAP and UX at its core. The company has inculcated SAP digital capabilities including SAP Hybris / C4C while deploying latest emerging technologies for continuous up gradations of the solutions. VitalWires has seen tremendous response from Enterprise customers where the organization is playing critical role in their Digital Initiatives, be it related to end consumer experience or enterprise SAP or non SAP users. It's not just about enabling these technologies but more about how the overall User Experience is stitched with Design Thinking & deep integration with other Systems. We'll love to hear from you ! Let us help with your digital transformation initiatives.